The Nature Walk may have delayed openings and early closings this winter due to inclement weather. In the event of snow and/or ice accumulation, the Nature Walk will be closed. We appreciate your understanding. This quarter-mile, self-guided, waterfront nature walk is located in Greenpoint, Brooklyn, along Newtown Creek and Whale Creek, adjacent to the Newtown Creek Wastewater Treatment Plant. Richly planted with native trees, shrubs and other flora, the Nature Walk revives a long-inaccessible industrial shoreline for public use as a waterfront promenade. Opening hours are from dawn to dusk, weather permitting. The Nature Walk is handicapped accessible. Restrooms and drinking fountains are not onsite. Guests are not permitted to enter the water, bike ride, skateboard, or roller-blade. The Newtown Creek Nature Walk is located at the corner of Provost Street and Paidge Avenue in Greenpoint, Brooklyn. One of the first design features you will encounter is a 170-foot-long “Vessel” passage to the waterfront that evokes the angled timber construction of ships built along the East River in Greenpoint. The actual boats were built from lumber floated to Whale Creek from Nova Scotia and milled where portions of the Newtown Creek Wastewater Treatment Plant is now located. A set of nine, 12-inch-thick granite slab steps that ascend out of Newtown Creek reflecting the common origin of life in the water and the sea. Scientific names are etched in the steps to trace the evolution of the Earth through geologic and biologic eras that include forms of life native to Newtown Creek and Greenpoint. Seven stone circles, etched at various angles with local, native place names used by the Lenape help visitors visualize the places they identify. A 1400-pound granite table in the shape of a shipping bollard, the cylindrical posts used to secure ships in port. Atop the table is an etching of Newtown Creek’s original watershed. The etching has a slight gradient, so falling raindrops will replicate the journey of the Creek’s waters. Trash receptacles designed to look like barrels, carefully selected plant material, and interpretive signage. 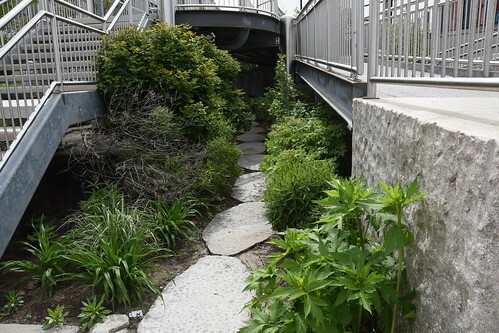 Explore the Newtown Creek Nature Walk by going on a fun-filled scavenger hunt, perfect for all ages. Discover hidden treasures as you journey through important cultural, historical, and scientific aspects of Newtown and Whale Creeks and the surrounding neighborhoods. Learn about the Lenape and where they lived, fished and hunted; how the tides and the landscape impact the flow of water; why the people and industry of Greenpoint was such an important factor in the growth of New York City; and, how wastewater is treated to ensure clean harbor water.